The lanes of the parishes of Geldeston, Ellingham and Kirby Cane intertwine lazily across the Waveney meadows to the north of Bungay and Beccles. Unusually for this part of Norfolk, the parishes keep their churches locked, which is unfortunate, but all three have keyholder notices. St Michael is set pleasingly on the side of a hill, which rises to the east beyond the church. Here, there is a sombre war memorial decorated with the crests of various regiments, and a good crop of 18th and 19th century inscriptions among the wild grasses. I liked it a lot. The exterior is crisp, thanks to two extensive restorations. In the 1860s, the chancel was rebuilt and a rather disproportionate north transept added to the designs of Thomas Penrice and JL Clemence. And then in the 1880s the tower was remodelled, at the expense of the Rector: fortunately perhaps, he ran out of money, for the architect's watercolour on display in the porch shows a planned moorish minaret which was never built. 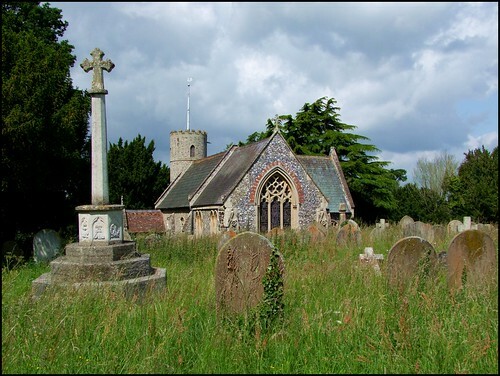 Otherwise, this is a small Norman church, one of many in the Waveney Valley, with the important exception that there is a fine late medieval porch on the south side, with crisply carved emblems of the Holy Trinity and Instruments of the Passion in the spandrels. The church is a little gloomy inside, as befits the period of its restoration, but the eye is led to the east, and one of Norfolk's more important 1950s windows. 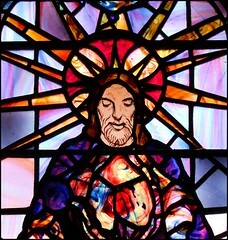 It is by Leonard Walker, and depicts the Risen Christ. It is similar to the same subject at East Tuddenham except that, unusually for the period, the elements are set in stretched, tinted glass. The mock-Early English double entrance to the transept is alarming, but the view westwards is of a typical rural parish church. The late 15th Century font is fairly typical too, except that it has an exceptionally clear dedicatory inscription to William Garneys and his wife. Interestingly, the designs on the panels repeat the Holy Trinity and Instruments of the Passion motifs from the porch - was William Garneys responsible for the porch as well? Dan Gillett, the Rector at the time of the 1860s work, has left a deep cut inscription at the entrance to the new vestry to ensure that his part was not forgotten. And there are other people remembered at Geldeston too. Robert Christopher Packe died in 1918, at sea, while on patrol duty off of Great Yarmouth. He was just 19 years old. Is his memorial the only one in East Anglia which records a birth in the Falkland Islands? Not far off is a very similar memorial to Henry Latham Kerritch. The Kerritches lived at Geldeston Hall, and Henry was mortally wounded in the assault on Passchendaele Ridge, September 26th 1917. He was 21 years old. An elegant inscription in a window records the sad fate of two of Henry Latham Kerritch's nephews, two brothers, in the next War. Hugh Richard Kerritch failed to return from Dunkirk in 1940, while John Arthur Kerritch died in Malaya in 1941. Both were in their early twenties. Just four of many Geldeston lads who failed to come back to this lovely rural parish.